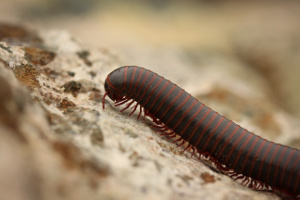 Millipedes have earned the name ”thousand-legers” by some. Their legs are so small and close together that they seem to be moving on hairs. In reality, these creatures have two pair of legs per body segment; the record is three hundred seventy-five pairs. Habits: Most are scavengers, feeding at night on decaying plants and at times on dead insects. In the autumn, millipedes are known to migrate in great numbers. During drought or heavy rains Millipedes will invade structures in an attempt to avoid drowning. Habitat: There are about 1,000 species of Millipedes occurring in the United States alone. Areas of high moisture and decaying vegetation, such as, mulches in flower-beds, piles of leaves, under trash, in piles of grass clippings, are likely areas of infestation. Threats: Some Millipedes secrete a fluid from openings along their sides when disturbed. This fluid can be toxic to small animals and cause blistering on humans.